I locked myself out of my office at work today. Twice. My mind has been preoccupied worrying about Piper’s kindergarten trauma drama. I’ve also just met my fifty-two new freshman who seem to be going through their own new school adjustments. Piper locked herself in the bathroom at school. Twice. She said it was nice and quiet in there. She wanted a little peace, a moment away from the substitute madness. One of her classmates banged on the door while Piper was taking a break from it all. “What did you do?” I asked. We spent the afternoon recovering in the only way we know how. 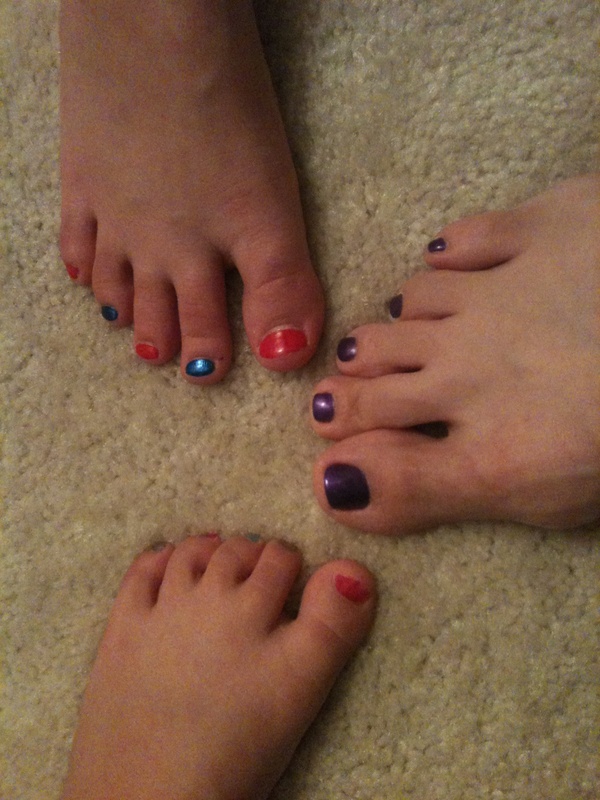 We ordered pizza, curled up with Sissy on the couch to catch up on Cupcake Wars, and painted our toenails. Now at least we’re ready to face tomorrow’s challenges with rainbow piggies. Oink. This entry was posted in Daily Dharma and tagged Cupcake Wars, humor, locking yourself in the bathroom, painted toenails, parenting, pedicures, piperism by melissa.scholes.young. Bookmark the permalink. I am all for locked door bathroom time – good for Piper! The Piper knows what she needs. I have to admire that. Sorry for the rough go. I hope the new teacher will alleviate the situation. Thanks. I hope we see a new teacher soon! I actually felt better every time I glanced their way. I think I was just remembering how simple the moment was painting them together. Every time that bubble of worry boiled up, purple piggies popped it. The toenail polish should definitely help. That’s a remedy in our house, too. The purple piggies made me feel brave. Piper’s were rainbow, of course.